It’s easy for all of us cash-deprived near-animals to judge the actions of our monied betters. So I’m asking you to keep an open mind when considering the tale of a 20-year-old son of a Swiss millionaire who deliberately set his Ferrari 458 Italia on fire in the hopes of getting a newer, better Ferrari. Just think about it from his side: he wanted a new one. See? I think you’re starting to understand here. According to the New York Daily News he wanted a newer, better Ferrari, and because he was afraid to confront his father (who, by the way, gives him up to $10,000 a month for the important job of holding his genes) and tell him that no, this Ferrari 458 Italia no longer suits my rigorous needs, he took the only course of action available: arson. It’s worth mentioning that he has 14 other cars, so you can really see the bind he was in. Only one of those other cars was a Lambo, too. Kid’s up against a wall here. Actually, the arson idea seems to have been proposed to him by a car salesman at a dealership where he had the Ferrari appraised. 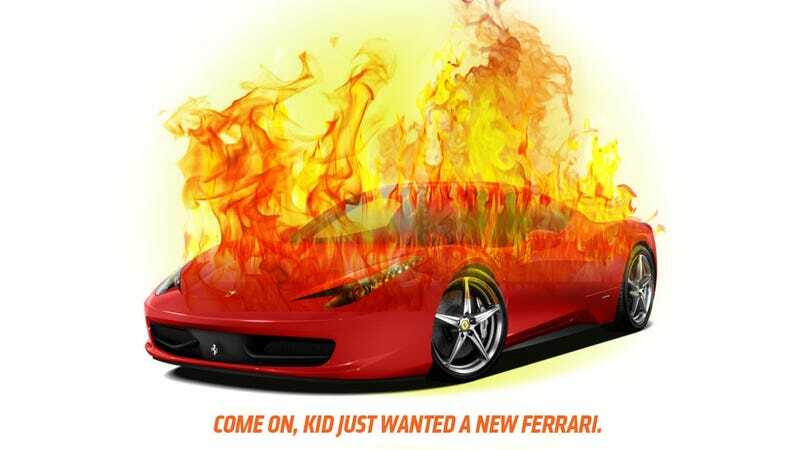 When the value of the car didn’t meet the amount the kid was hoping to get so he could upgrade, the resourceful salesman suggested taking advantage of the dealership’s unique ‘set-fire-to-your-car-to-scam-the-insurance-company’ plan. The kid hired two people (at about $15,000 each) to set fire to the car, which they did after crossing the border into Germany. Meanwhile, the Ferrari’s owner and a friend developed a nice, relaxing alibi at a nearby massage parlor. And it all would have worked, too, with everyone happy, if it hadn’t been for those meddlesome security cameras recording the whole act of arson going down. The Ferrari is burned to a crisp, the kid gets 22 months probation and a $32,000 fine, though it’s not clear what charges his arson employees got. And now the kid only has 14 cars. Fourteen! Like some kind of filthy animal. I think it’s clear who’s the real victim here. So, the lesson here is that while arson is generally a fantastic way to solve problems and get the things you want — no, scratch that — deserve, please, please, always check for surveillance cameras first. More photos of the exotic conflagration over at 20 Minutes.